This divinity is a total experiement for me. The last time I ate it, I was ten years old. No one I know has made it recently. So I just read the recipe and tried to recreate. I think that I didn’t beat it long enough. According to the pictures posted on the internet, divinity forms fluffier balls that retain that shape when dropped onto the wax paper. Mine flattened out quickly into little frisbees. They are not a total loss though. They still taste good and the consistency is melt in your mouth. Do you readers have any tips for making divinity? I plan to make these again; maybe the next time I will use another flavoring than vanilla. I have read that you can use peppermint or almond extract. And that you can add food coloring for a more festive presentation. In a heavy saucepan over medium heat, stir together the sugar, corn syrup, and water. Stir only until sugar has dissolved. Allow syrup to cook until it reaches 250 degrees or hard ball stage on the candy thermometer. While the syrup is cooking, beat the egg whites until stiff peaks form. When the syrup reaches 250 degrees, carefully pour a slow steady stream of syrup into the egg whites. The mixer should continue running though this point at a high rate of speed. Add vanilla and continue to beat until the mixture holds shape (approx 5 minutes). Stir in pecans. Quickly spoon out spoonfuls of the candy onto waxed paper. Work quickly as it tends to become stiff quickly. Allow to dry and then store in an airtight container. 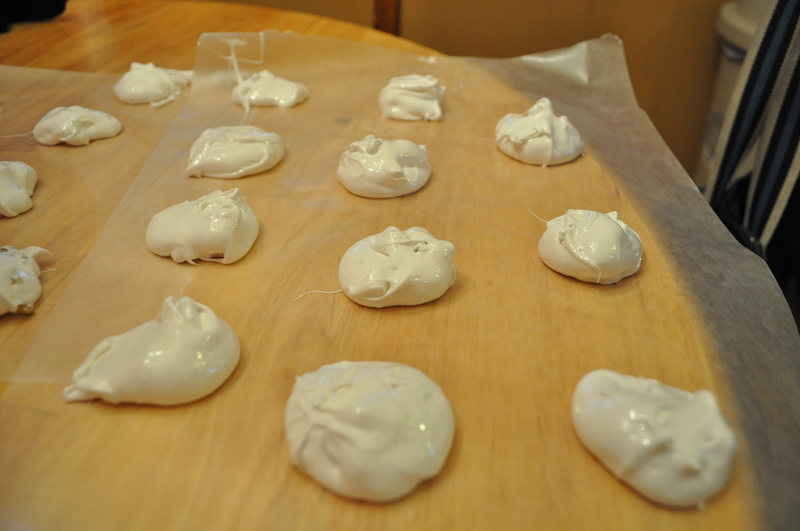 I’ve never made divinity but think yours look so shiny and beautiful… I bet they tasted great as well! It did taste good. And not too hard to make either. Looks like it turned out perfectly! Have a great New Year.